Contact us today to schedule your first visit! Drs. 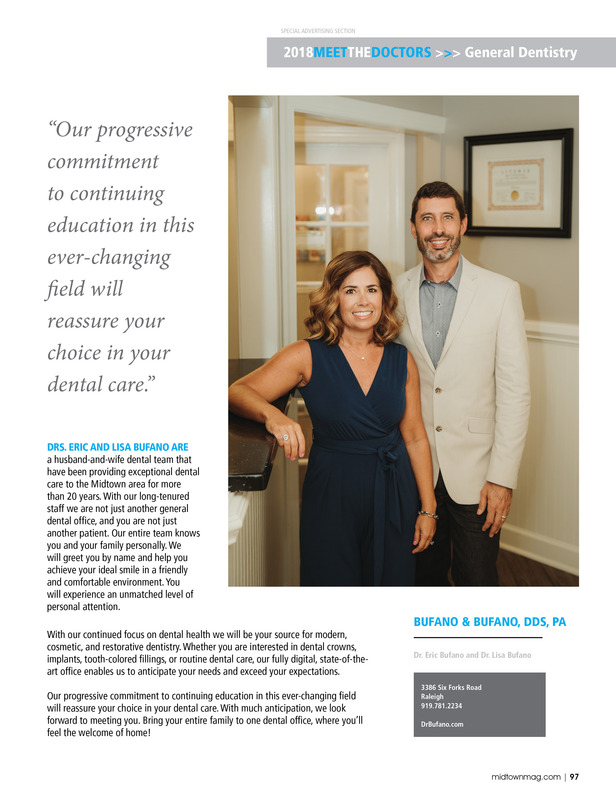 Eric and Lisa Bufano are a husband and wife dental team with an energetic and enthusiastic staff who help make your dental visit a friendly one. Their office provides the latest in cosmetic dentistry including teeth whitening. With the help of their intraoral camera they can show you and help you understand your dental treatment. Bring the whole family to one office for all your dental needs. Thanks to the support of our wonderful patients we have won a 2019 Midtown Magazine Diamond Award for “BEST DENTIST”. We would like to send a heartfelt “Thank You” to all of our patients who voted for us. We appreciate your loyalty and look forward to seeing you at your next visit. Thanks again and have a great 2019! Fast, painless and on time! I have been going to this practice for many years and will continue as they are courteous and kind professionals!